Welcome to my review of the Teeter EP 970. 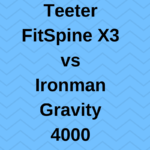 Today we will take a look at this innovative inversion table from Teeter and dive into the features that I think make it a great option. If you suffer from back pain, talk to your doctor and see if an inversion table is right for you. Teeter has been in the inversion table business for many years, and they are definitely a leader in the industry. I personally own a Teeter and have used it more times than I can count. I think they build a high-quality product and would like to share this table with you. 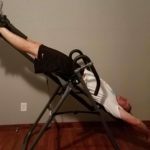 If you are tired of taking pain medication or have tried other methods that just don’t work, an inversion table may be a great option. I use my table for chronic back pain, and that is the angle I take with this review. I know other people will use an inversion table as a piece of workout equipment. Anyway, sit back, relax and let’s dive into this review. Summary: You can’t go wrong with the Teeter EP 970 inversion table if you are looking for a product that is well constructed and will last you for years to come. 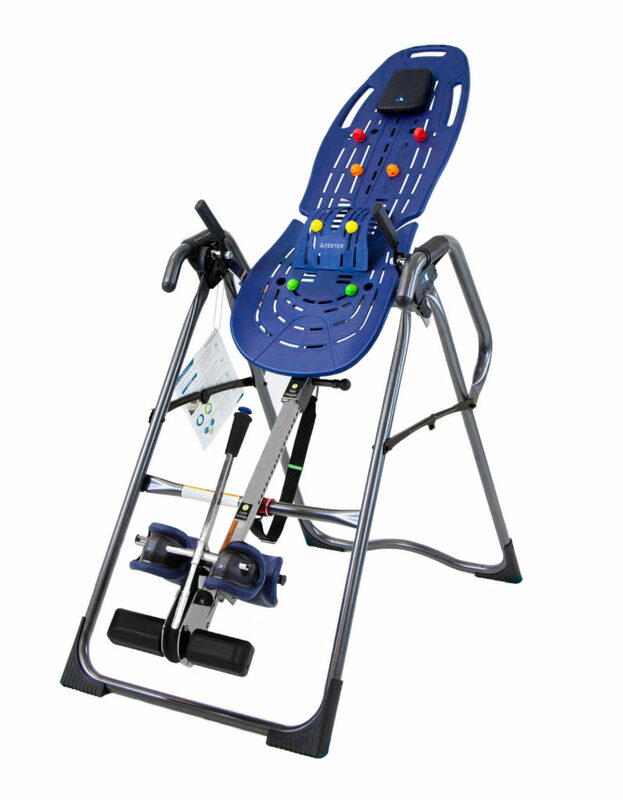 Teeter inversion tables are built with quality steel construction. The solid foundation will give you peace of mind, as you are using the unit. One really nice feature is on the base of the frame, there is a built-in grip that you can hold onto if you are interested in a deeper stretch. This is a great inversion table for tall people. The backrest is molded from a plastic material that is designed to move with you as you use the inversion table. The bed will flex if you decide to twist or turn to stretch out different areas of your body. It is a very comfortable backrest that also allows for airflow, so you won’t end up with a sweaty back. The backrest is also designed for use with acupressure nodes for added relief of tight muscles or knots. You are free to put the nodes wherever your back is needing some extra TLC. The table also comes with a removable lumbar support for your lower back. These are just a few of the included customizable features that tend to set Teeter tables apart from some of the others on the market. One thing that really stands out for me on any inversion table is the mechanism that locks you in place. You want to feel secure and comfortable as you turn your world upside down. I think this is extremely important. So, for me, the ankle locking system is comprised of the footbed, ankle cushions, and the locking/release handle. I will break each of these parts down next. The footbed is what you step on when you first enter the inversion table. Teeter has designed this footbed with a High and Low position. 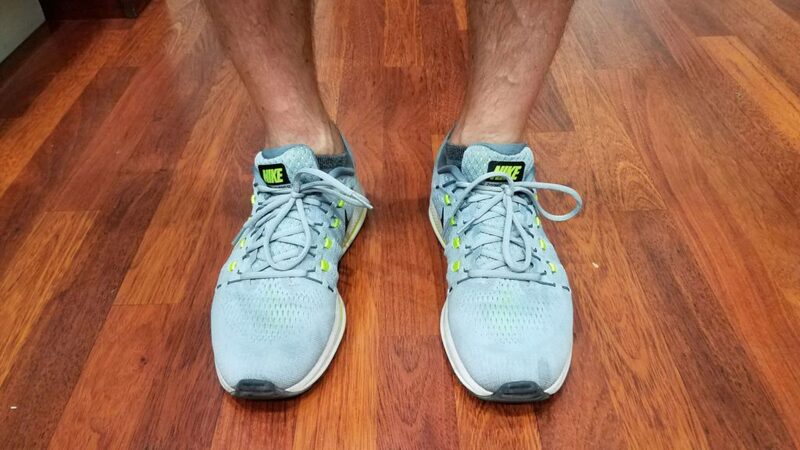 Basically what this does is it allows you to make sure the ankle cushions (discussed next) will be as close to the top of your foot as possible. By simply rotating the footbed, you are able to raise or lower it depending on your needs. This is an overlooked feature on a lot of tables out there. Ankle cushions come in a lot of shapes and sizes. The cushions on the Teeter EP 970 are contoured to fit securely around the front and back of your lower leg. They are firm yet comfortable and provide excellent support, I know because I own a variation of this Teeter model. The cushions are also adjustable up and down as well as slightly side to side so they will comfortably support your ankles. Now it’s time for one of my favorite parts of the inversion table, the locking/release handle. No really, this is one of my favorites, stick with me, and I will tell you why. The locking/release handle on this unit is LONG, and that is really important, especially if you are like me and have a back injury. The less bending over the better. I have been injured with a herniated disc, to the point that it was very painful to bend over, so an extra-long handle was crucial for me. With this particular model, you will be able to firmly and securely lock yourself in place. The last thing you want is to be hanging upside down, not knowing if you are going to end up on the floor. When you are done, the handle is conveniently accessible with minimal bending. 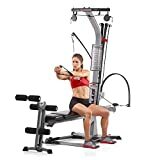 Anyway, this is not necessarily critical for everyone, but I think it is something you need to consider when purchasing an inversion table. The EP 970 from Teeter allows for users up to 6’6” tall, so it’s definitely a good inversion table for tall people. Adjusting the user height is a pretty simple process with the markings on the main shaft. Basically, you unlock the shaft, and it slides out from behind the backrest. The markings correspond to your height, and then pick the appropriate mark for you. Now, there may be some further adjustment necessary, and that is the next topic. Since no two people are created equal, you may have to adjust the height slightly, depending on your center of gravity. I will explain. You should be able to rotate in and of inversion using arm movements. If the settings are correctly adjusted, you should not have to pull yourself up using the handrail. So, if you are not able to freely rotate up and down, you will need to adjust the height accordingly. This Teeter model also has a roller hinge assembly, which makes the table more responsive or less responsive, depending on your experience level and weight. The included instructions will give you more insight into this as well. Having a spotter with you while you are getting the settings straight is definitely recommended. You don’t want to get stuck upside down. One last adjustment to make and you are all set. Adjusting the inversion angle on this table is pretty straightforward using the included pre-marked tether strap. The strap is marked at 20, 40 and 60 degrees. Plus you can choose any angle you like, but these are some of the more common ones. I will tell you why I prefer the strap angle adjustment to the preset pushpin models, again, drawing on my own experience. The pushpin models are foolproof, so that is one for the plus column. The downfall with these types is that you are stuck with the preset angles. These typically are in increments of 15 or 20 degrees, like 15, 30, 45, etc., or 20, 40, 60, you get the point. When I was recovering from my back injury in 2015, I was only able to increase my angle of inversion in small increments. I was not able to make a 15 or 20-degree jump. So, for me, the tether strap and the ability to make micro angle adjustments were vital. This may not be an issue for everyone, but again, something I think is essential to think about. Not everyone would know to take this into account when shopping for a table. Setting up an inversion table may sound daunting, but it’s really not that bad. Once you have the setting so your liking, you may want to write them down, especially if multiple people will be using the table. One really nice thing with Teeter inversion tables is the relative ease of assembly. These tables come mostly, that’s right, mostly assembled and finishing it off is not too bad. Please check out my post for more suggestions, but my top recommendation is to have a helper. Inversion table parts are heavy and awkward, so putting them together can be cumbersome, especially if you have a back injury. I recommend a helper to assist in the assembly process. Another tip is to build the table in the room where you will be using it. Again, inversion tables are heavy, this one weighs 65 pounds, and are not always easy to move. 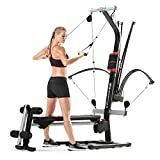 Building it in whichever room you are planning to use it will save you the headache of moving the fully assembled table. Of course, you have the option to pay for assembly as well. Now it’s time for my rant on storing an inversion table. Truth be told, these things are not all the easy to store. Again, I recommend setting up in a room like an office or basement where you will use and store the unit. Since the table is foldable but does not lay completely flat, I suggest just leaning up against a wall when you are not using it. I have tried to get my table underneath the bed, to appease my wife and keep it out of sight. Well, this involves removing the backrest, lifting up the bed and sliding it under. What a pain, literally. This is especially true if you are dealing with a back injury. So, do yourself a favor and set it up in a place where you will have easy access to using it. 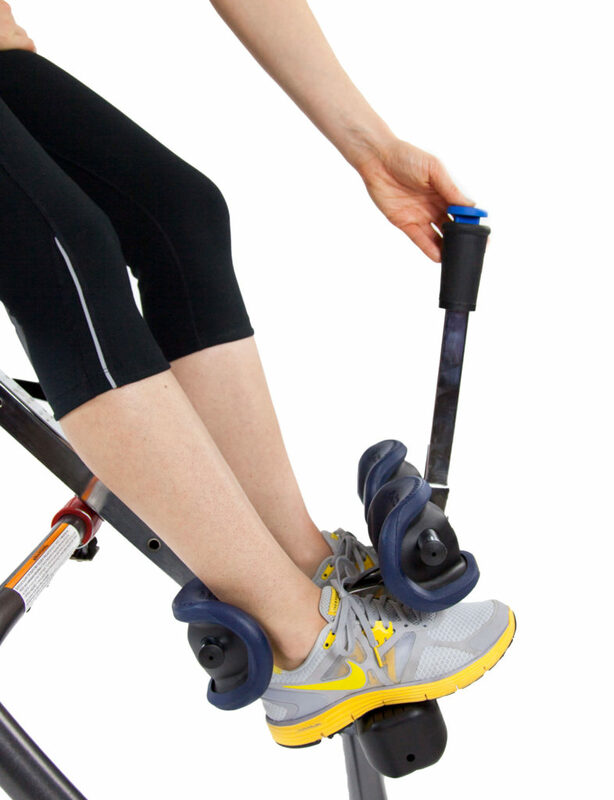 If you have used an inversion table before, this may not surprise you, but my tip is to wear shoes when you invert. This just makes the whole experience so much better. I have tried the barefoot route and let me tell you, this is not a comfortable way to go. Mainly I went barefoot because I couldn’t bend over to put my shoes on. Anyway, I hope you will take my advice. 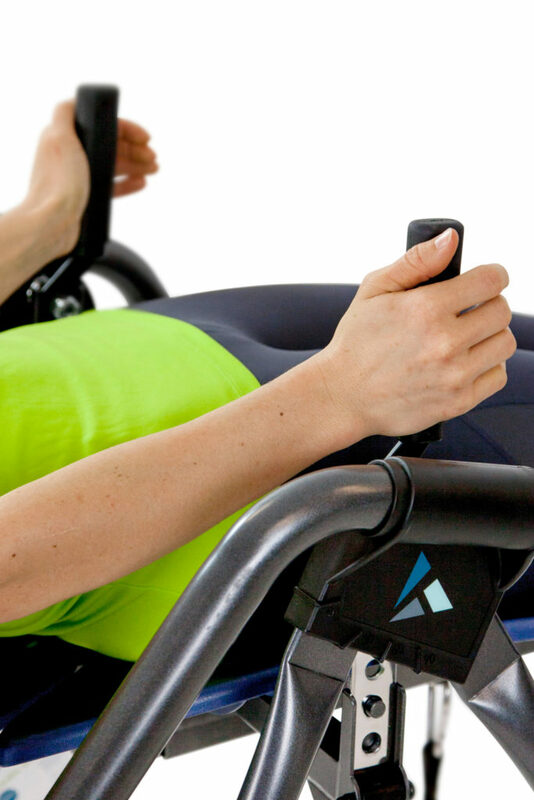 Choosing an inversion table can be quite a task, but it doesn’t have to be. There are a lot of choices available. I hope you will consider the EP 970 from Teeter. When you take a close look, there is a lot of functionality built in that other tables do not have. I will tell you one thing, if you buy a quality inversion table, it can last you for many years. 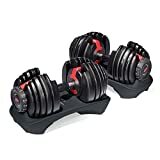 If you are only interested in using the table for a short time, like to recover from an injury, then you may not want to spend a lot of money. In fact, for you, this may be something you don’t keep for a long time, think crutches. When you are done with them, you get rid of them. For me, dealing with chronic back pain, the choice was easy, buy a table that will last a long time. If you are interested in more information or would like to purchase this table, please click here. 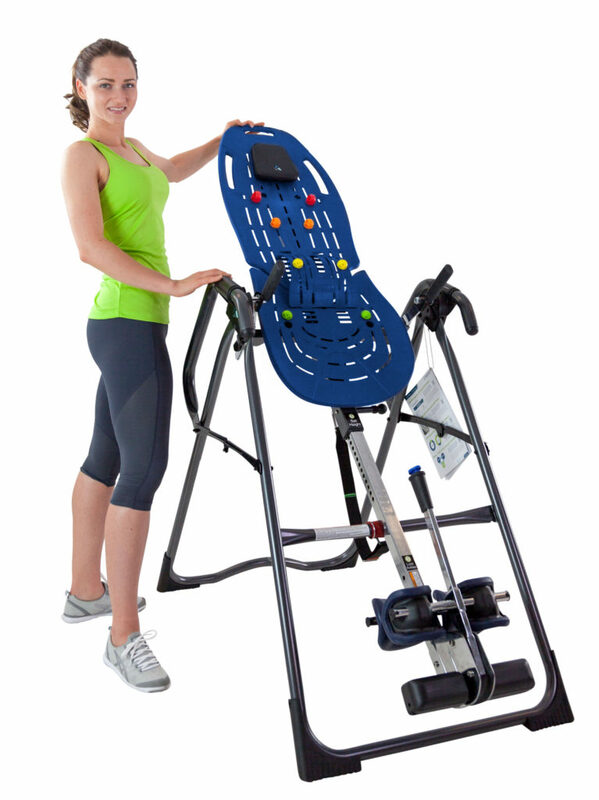 For information on Teeter inversion tables, please see my post, check out the link to the left. As always, thanks for taking some time out of your day to stop by. If you have any questions or comments, please leave them below, and I will get back to you as soon as I can.